Landry's Ski Slope was one of those classic family owned local ski hills that had its heyday decades ago. I managed to find this area quite at random, and thankfully had some good luck once I did. My friend Dave Kirk has a summer house in Windham, NH, and his mother had told him of the old ski area about 2 miles south of their house. We decided to take a drive and find out what was there. We parked at an elementary school just down the street from it. Sure enough, the area was there, but it was very small--vertical drop was a good deal less than 100 feet! We could only see an overgrown slope, but it appeared that a small warming hut was still standing. So we walked over to the warming hut, and began to look around a little. As we were looking at the base lodge, a car drove through the field over to us. I went over to explain who I was, and what I was doing. I asked him if he knew anything about the area, and he told me that we was the former operator, and still current owner of the property. We started talking about the area and its history. It opened in 1958/59 and closed in 85/86. It had an 800' rope tow. They had one main slope, an "iced over" toboggan run, and a 15 foot wide trail. The rope tow was powered by a 1951 Ford Engine, replaced in 1969 by a diesel one. They charged less than $5 on weekends. They closed due to insurance reasons. The owner (Mr. Landry) then explained how the rising insurance rates and taxes had caused 342 areas to close in NH. I don't believe the 342, but he seemed sure of it. 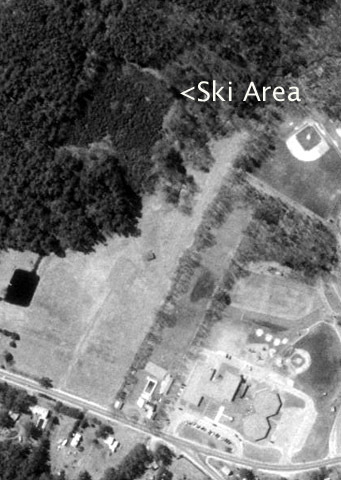 Landry's Ski Slope as it appeared in April of 1992. The parking lot can be seen at the end of a driveway in a field, above the "USGS" sign. The warming hut is at the end of the parking lot. From there, you can see the rope tow line, wide slope, and a few of the trails that have almost grown in completely. The 1998 aerial shot shows even more growth on the trails/slopes, but you can still make them out. Then we got in discussions about lifts. He loved rope tows, and believes that they are the best lift ever invented. Pomas are also his favorite, and he told me some really random trivia. He went up to Intervale, NH in 1984 to remove the poma at that closed ski area to install at his place. He took it down all by himself. Unfortunately, the next year he closed so it could not be installed. This was after he refurbished the entire lift. Then, the owner of Atlantic Forest in Amesbury contacted him about the lift, to which he sold the poma hangars. Anyway, I told him that I had seen Atlantic Forest, and he mentioned also that the town operated a very small area as well. The poma towers were still behind his garage. He told us that he was glad to hear that people were interested in talking about these closed places, and that someone of my age would actually care and be interested. He told us how to reach the top. We walked up the old trail...very overgrown...but the rope tow top building is still standing. A very interesting story for what had appeared to be a very simple area. A shame that it closed. 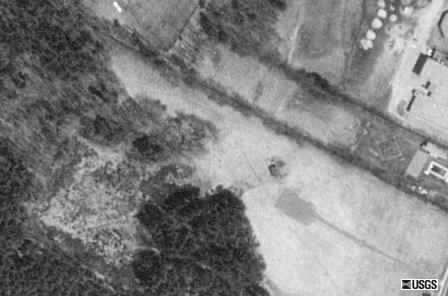 A more recent, probably 2005-2006 view of the area from Google Earth shows continual growth, and that the lodge is still standing. Click on above image for larger version. Sarah Usher: I grew up in Windham NH in the mid to late 60s and learned to ski there with my sister and her friends. I remember living in complete fear of the rope tow and the icy track that would form under the skiers upward bound. I remember falling and catching the rope with the tip of my ski and causing a whole line of skiers to collapse into a giant whining heap. I also recall a tobogganing expedition on the back side of the hill. We enjoyed scalding hot cocoa in the warming hut. My sister's friend Barbara fractured her leg there--and so I remember huddling in the warming hut scalding my mouth on the cocoa watching the ambulance load her up. My least favorite memory, however is of V-walking up the hill--the rope tow was looking better after that! As youngsters we skied at other local lost areas like Spigot Hill (with a friend of my mother's from Switzerland (skiing between his fancy Swiss ski pants-ed legs!) and also at Birchwood in Londonderry. The bigger resorts in the north--Okemo, Waterville Valley, Canon Mountain, King Ridge, etc are all blurry memories, but I will never forget the collections of lift tickets hanging off our poles from Landry's! 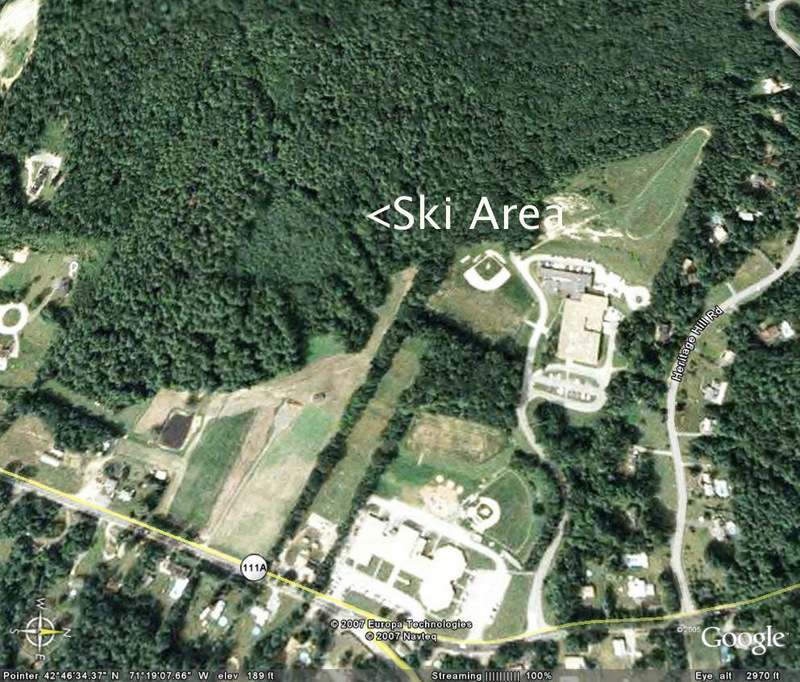 Jim Thibodeau: I wanted to write as I had seen one of the lost ski areas I used to frequent...the name was Landry's ski slope, located in Windham, N.H.. The owner, you mentioned as Mr. Landry did a lot for us when we were young. He was a fine gentleman and is deserving of much thanks... I skied there in the late 60's with an organization called the Windham Recreation Commission. Mr Landry, I always knew him as Victor, gave a small group of us individual instruction, and after the lesson we got to ski there for one hour, free of charge. Mind you, to practice what we had learned usually under his careful supervision. For this I will always be eternally grateful to him. The toboggan run, iced over as you had mentioned, lives on with many of us older folks simply because it left us with a lot of bruised and broken ribs, legs, etc. You see, at the time, toboggans and "saucers" were being replaced by plastics. One can only imagine going down that hill, becoming airborne and landing, belly first onto the icy run. There were times when the run was closed because of injuries. If you had the nerve you hiked up the side of the run all the way until you met the rope tow. Speed was essential if you were able to make it completely down in one piece, you usually ended up in the pond at the bottom of the run, and got an icy bath as a prize for your bravery. We used to climb up to the top of that ski slope, late in the evening to perform another right of passage as young adults, or in hindsight hooligans, making it down the ski slope... in the pitch dark...without being caught...by Mr landry's mom Rita...on a metal grain shovel..without hitting the warming hut at top speed and committing certain suicide. Many people, both veterans and novices met with that fate. Most of us were on a first name basis with the members of the Windham Fire Dept... as some of us had dads who worked there.